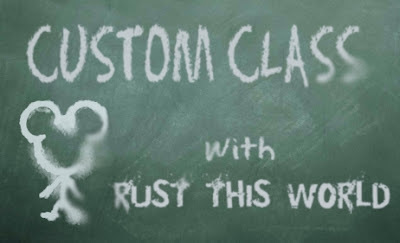 This week in Custom Class, I’m going to be showing you how to strip paint off of Vinylmation figure. Paint removal is kind of advanced technique, and definitely only applicable in very specific situations. With the I Heart Mickey series that just came out, us custom artists now have a cheap and easy source for Buzz bubble helmets. Unfortunately, they all have some sort of paint on the inside of the back part of the helmet. I’ve had a lot of people asking how to strip paint from something. I’m going to show you two different ways. Here are the two products I’ll be using. On the left is a bottle of acetone nail polish remover. This is the stronger of the two liquids I’ll be using. It strips paint off figures really easily, but is also a lot easier to mess something up with. On the right is my bottle of brush cleaner that I use to clean the paint out of my brushes after I’m done painting. It’s definitely more gentile than straight Acetone, but it may take a bit more work. So I’ll start with the helmet. I’m using the brush cleaner for this because I don’t want to accidentally mess up the inside of the helmet, since it needs to be clean when I’m done. What I do is dip my brush into the brush cleaner and just brush over the spot I want to remove the paint from. Depending on the paint, sometimes I’ll brush the stuff on and then give it a minute to dilute the paint, before wiping it off. As you can see, I can not wipe off some of the paint. It takes a few layers of brushing, then wiping, then repeat until it’s completely removed. Next up I have a Bambi 25th Anniversary figure that I want to completely remove the paint from except the face, which I’ll just paint over. I start by brushing on brush cleaner just like before. With the ears completely clear, I move onto the body. I don’t know how the glue and glitter will react to the brush cleaner, so I sanded it down to just the figure and paint. Using the same technique, I gradually am able to remove the paint from bamboo’s body and arms. She had several layers of paint, so it took longer and was a bit messier than just the writing on the helmet. Eventually, I was able to get his entire body down to just the plastic. For the last part of the lesson, I’ll be using Acetone. You don’t want or need any industrial strength acetone as there’s a good chance it will melt your figures. Nail polish remover with Acetone in it will work fine. If it can’t eat through the plastic bottle it comes in, it won’t eat through your figure. If you’re buying the acetone in a metal can, you’re over doing it. I’m going to be turning this I Heart Mickey figure into just a clear red figure. Because Acetone is more acidic than the brush cleaner, I use a cue tip instead of my brushes so that I don’t destroy my brushes. I pour a little bit of acetone into the cap to dip my cue tip into and begin to wipe away the paint. It may takes several passes and multiple cue tips to remove all of the paint and sometimes it will just smear around. I probably went through 7 cue tips, using both ends, to get it to this stage where it’s completely clear. To stop the acidic effects of the acetone and make sure it doesn’t melt my figure, I run the figure in some water and dish soap. The soap acts as a base to cancel out the acetone. And finally, I end up with a plain clear red figure on the current mold. 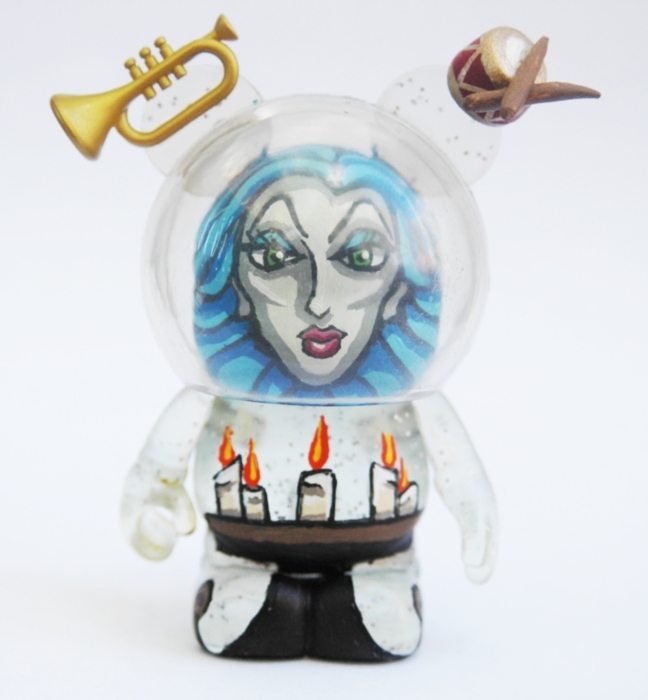 By stripping the paint from the Bambi figure and the bubble helmet, I was able to make this Madame Leota figure, which I like so much more than the version from Haunted Mansion. An additional note: Don’t use acetone on the bubble helmets, it just melts the plastics and creates a huge mess. Fantastic! Will be putting this to good use later on today.